Get more from your course! These free sailing instruction videos online will show you the core elements of each of our training courses and will set you well on your way to passing each one. 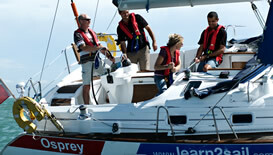 Learn before you go and afterwards brush up on what you've learnt, now LET'S GO SAILING. An exciting introduction to becoming a competent crew where you will learn all the basic skills required to sail a cruising yacht. Please Note: To watch the free training videos, you will be asked to give us your name and email address so we can keep you updated with offers and course availability. We will then provide you with the links to watch our videos. Essential guidance and teaching to help you get your "Driving Licence to the sea", your International Certificate of Competence (ICC). Unbearthing the yacht using the "Holding Position"
We'll show you how to fully develop your skills to a level where your sailing becomes instinctive and your confidence will soar. Prop Kick - Turning "short round" explanation. Coming alongside/springing off - "The Holding Position"
Manoeuvring off the berth - use of the bow spring. Turning short round - practical demonstration. Berthing to a finger pontoon - explanation. 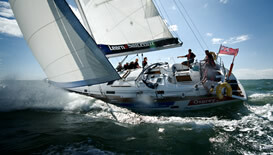 Downwind sailing - use of the gybe preventer. "Man Overboard" - under power. "Man Overboard" - under sail. Picking up a buoy under sail - "Fill or Spill?" All videos are for personal viewing and may not be resold or distributed at any time without prior consent from Learn2Sail Ltd.